Ikara was an Australian-designed ship-borne long-range anti-submarine guided weapon that was developed for the Royal Australian Navy (RAN) and achieved international recognition. Ikara was based on work previously carried out in the early 1950s on the Malkara wire-guided missile. The Ikara weapon system was conceived to exploit the longer detection ranges of increasingly sophisticated sonar equipment and make the best possible use of the search and detection capabilities of modern homing torpedoes. It did this by carrying the torpedo in a fast winged missile that was launched from the ship and accurately guided to the target area by radio commands. The missile was then commanded to release its torpedo which parachuted into the sea in the best position to track down the submarine. Design and construction of Ikara began in 1960. Under the guidance of Murray Evans, the Aeronautical Research Laboratory, Fishermans Bend, was responsible for designing Ikara and its control system, as well as testing, performance assessment, trials planning and evaluation, and manufacture of prototype parts. Weapons Research Establishment, Salisbury, was responsible for developing the solid propellant rocket motor and the tracking and guiding equipment for the missile. The Royal Australian Navy (RAN) developed the magazine, handling and launching system. Also involved were the Government Aircraft Factory, EMI (Australia) Ltd, and approximately 200 sub-contractors. 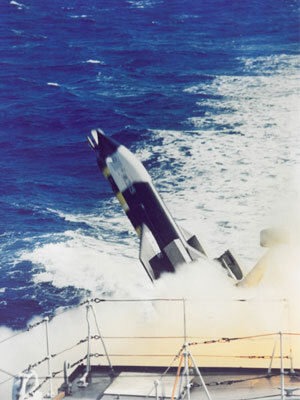 After an extensive period of development, the first full-size Ikara missiles were launched at Woomera in 1963; and the first full-scale trials were conducted from HMAS Stuart off Sydney also in 1963. The first production version of Ikara entered service on HMAS Derwent in 1966. The first public firing of Ikara took place from HMAS Perth, off Jervis Bay, in 1968. Delivery of modified Ikara systems to the RAN commenced in 1968. Ikara was also adopted by the Royal Navy, the Brazilian Navy and the Royal New Zealand Navy. However, while an excellent system, Ikara was not updated and became increasingly expensive to maintain, and it was withdrawn by the RAN in 1991. For services to Defence science.